Today's card had a bit of a difference to it. 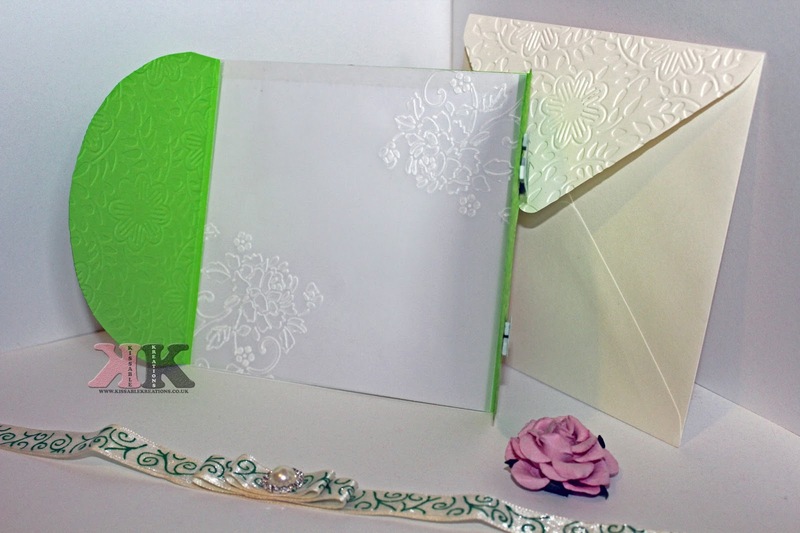 I'm normally just making the standard one fold card but today i made a beautiful gate fold card. I was asked to make this card as a matter of urgency as the lady needed it for a wedding she was attending. She wanted a card which was Saint Patrick's Day themed. Although I was literally going out of my mind trying to figure out how I was going to make this card I finally come up with this idea. All I kept thinking was green, green, green. Love hearts, Leprechauns, Rainbows, Gold, Flowers and clovers. I totally ditched most of the ideas as you can see and I'm so glad I did else I wouldn't have come up with this beautiful design. *First of all I chose out a beautiful lime green card. I had to make a template first by folding a piece of card in half then those halves in to halves themselves. I then cut an arch out of both of the end pieces and used that as a template for the actual card. Long winded I know but hey it worked in the end. *The next thing I did was emboss the sections i'd just cut from. It was a shake up between a few folders but I thought the one I used looked the best. *Next came the bow. After spending an hour trying to figure out how to add the patterned bow to a plain white bow and then opting to stick them using double sided sticky tape, I cut the Ribbons to size and stuck them together to form the bow and added a cute pearl to the centre. 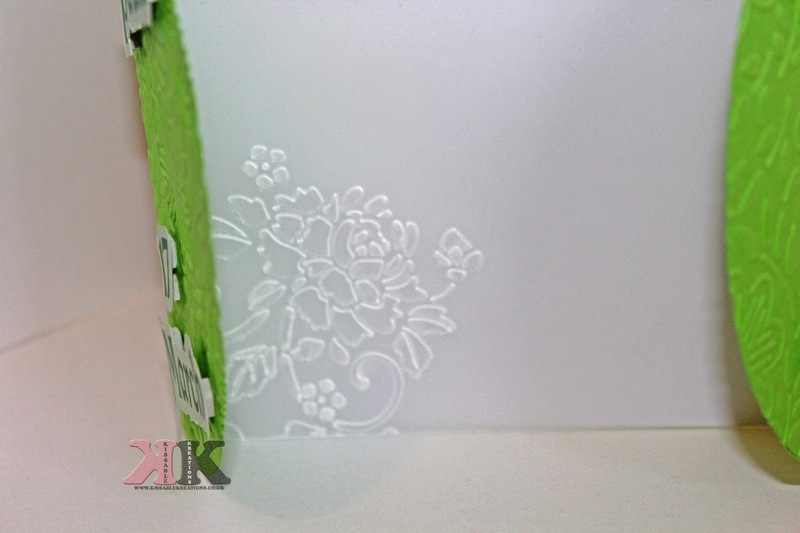 *Using a piece of vellum I cut it to size to fit the inside of the card and emboss the two adjacent corners with a flower. *Underneath I added a plain piece of paper which I left blank ready for it to be written on. *Next I printed off some lettering which I cut out and added to the front using foam pads to give it a bit of depth. *The envelope was emboss with the exact same folder I used to emboss the actual card. This is a pretty unique thing to do as iv'e never seen another card maker do this before. It just adds such a beautiful addition to the card. All in all I loved making this card and i'm certainly going to be making another of these types. The lady was very happy with what I had come up with and i'm so pleased she liked it. Iv'e made a beautiful wedding topper for a card iv'e been asked to make. It's for a beautiful couple who will be getting married later on this year. The actual card will be fresh and elegant. This was just a simple decoupage kit. Although all the pieces have been cut by hand i think i did an amazing job putting it all together. I added a bit of sparkle to the back of the brides dress and also on the flowers. I think it just adds a bit more glitz to the decoupage. I will certainly be posting the end creation. Today's card is for a lovely friend who is sick in hospital. A lovely card always makes someone smile when they're having a bad day and that's no different for people who are sick. My cards always seem to give them that little bit of a lift. *First i took a topper and used foam pads to matted and layer it on to a piece of card which was cut to the same shape but a tiny bit larger. *Next i took the sentiment and added this with the foam pads also. *The pearls made a lovely touch to the two corners of the topper. *I took a piece of gradient card and cut it to size. I added this to the topper using tacky glue. *Last but not least i added all of this to a plain white card which luckily i had in my stash. It matched the shape of my topper perfectly. A perfect card hug for a lovely friend. I really hope she likes it and she gets better soon. I hope you've had a great day so far. Iv'e been getting my craft on! Today's make is a lovely card for a beautiful little girl who just turned 5. She adores horses so i went out of my way to buy her some lovely toppers for this amazing card. *First i took the toppers i had bought and assembled them together. There was the picture on the top which i matt and layered on to the purple background. I then added these to a piece of a5 purple gradient card i had and cut it to size. *Luckily i had some plain white cards which was cut to the same design as the topper i just made. I added the topper using tacky glue and left to dry. *Next i made the handmade bow and added a small flower like pearl to the centre. This was then stuck on using glue. 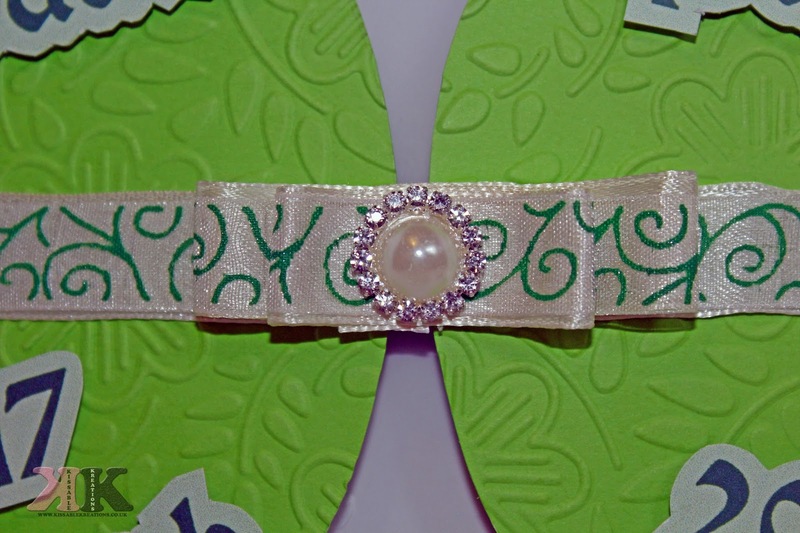 *Last but not least i chose out some gorgeous half pearls and added them to two of the corners. This card didn't take me long at all as most of the work for done for me. There was very minimal cutting to size as the pieces just went together perfectly.